Thousands have started to march, responding to a call issued days ago, to the headquarters of the ruling Supreme Council of the Armed Forces (SCAF), protesting that the January revolution’s demands remain unmet. The call for the march was renewed when the SCAF released a statement Saturday accusing the 6 April Movement of attempting to trigger strife between the military and the people. The SCAF statement was perceived as an attack on political groups that contributed to the January 25 Revolution. More than 28 political groups issued a joint reply. The reply issued confirmed that a demonstration would be held Saturday, not only to criticise the way the SCAF has responded to the revolution’s demands, but also as a response to the accusations it made against the 6 April Movement. The SCAF statement came after thousands had attempted to march from Tahrir to the military council’s headquarters Friday evening, leading to clashes when the military police intervened. A number of inhabitants of the Abbasyia district, where the march was heading, also clashed with demonstrators. 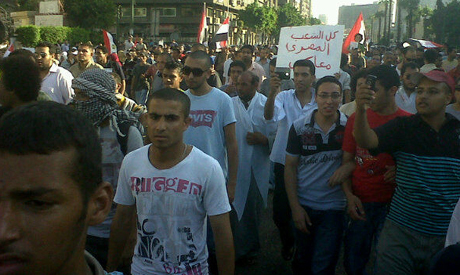 As a response to the SCAF statement, the 6 April Movement declared that it had no involvement in the demonstration. Meanwhile, no other political group confirmed its participation in the march, which appears to have started spontaneously in Tahrir Square.